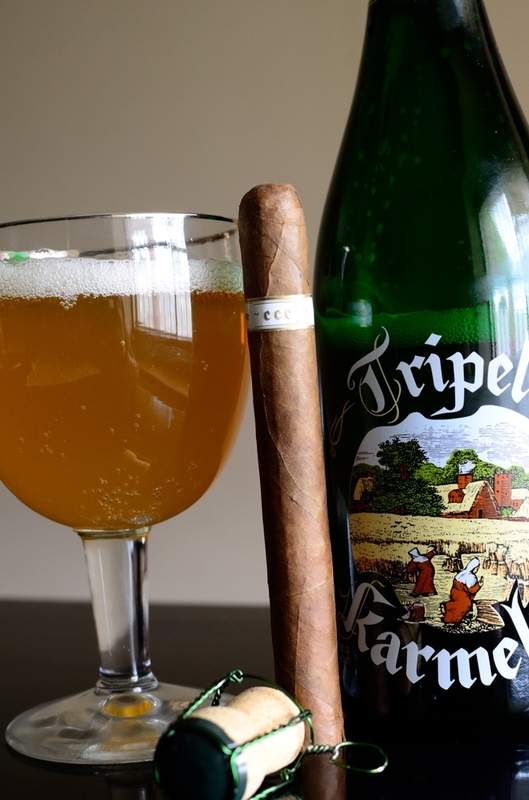 Today’s lineup includes an Illusione ~eccj~ 20th paired with a bottle of Brouwerij Bosteels Tripel Karmeliet. The Illusione ~eccj~ 20th is the bigger brother of a cigar with the same name that was originally released in 2008 to celebrate the 15th anniversary of the “European Cigar Cult Journal” magazine. 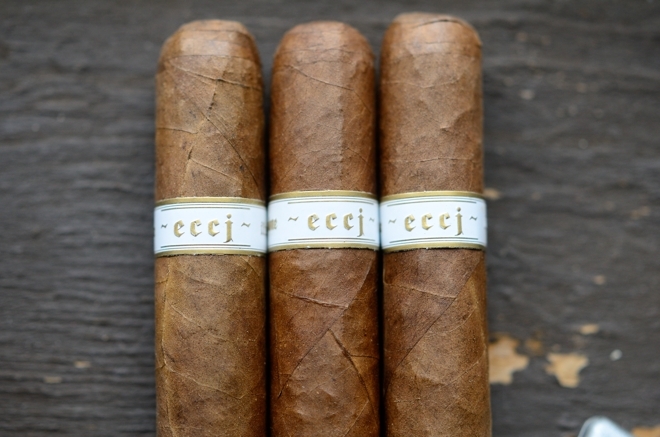 As the name suggests, the ~eccj~ 20th was released this year to celebrate the 20th anniversary of the same magazine which now goes by the much simpler name “Cigar Journal”. Going back to the original ~eccj~, this blend was very limited and only available through New Havana Cigars. The cigar was such a success that Dion Giolito, owner of Illusione cigars later released the blend under the name “Epernay” as a full production cigar and one of my favorites, if not my favorite Illusione lines to date. The Illusione ~eccj~ 20th was showcased last year at the IPCPR show in Las Vegas, and released during January of this year. Created at the TABSA factory in Nicaragua, the blend features a Nicaraguan Corojo 99 wrapper, Nicaraguan Binder, Nicaraguan Criollo 98 and Nicaraguan Corojo 99 fillers. The ~eccj~ is only offered in one size, 6 1/4 x 48 which comes packaged in boxes of 15 running $13 a sick. While only 4,500 cigars from the original ~eccj~ cigar were released, 30,000 ~eccj~ 20th are available and sold by retailers throughout the US. I got a handful of these from out good friends over at Fox Cigar Bar in Gilbert, Arizona. The Illusione ~eccj~ is a beautiful cigar. 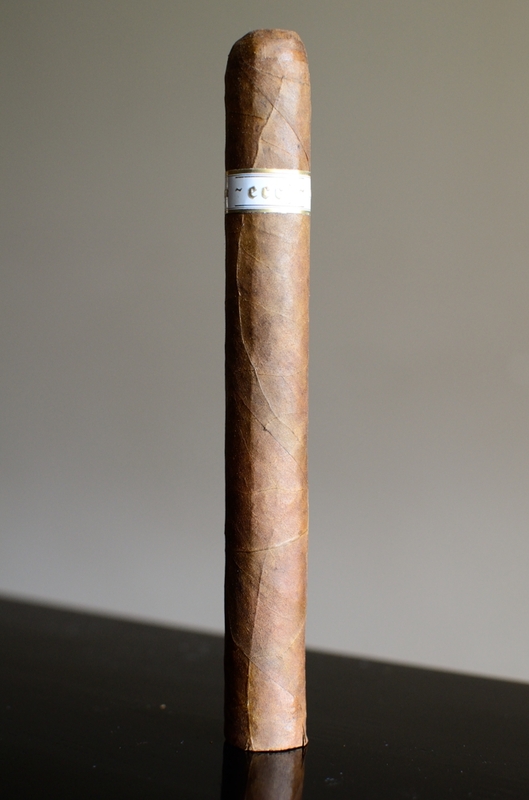 The ~eccj~ starts out with an absolutely gorgeous, consistent, medium brown, silky wrapper. 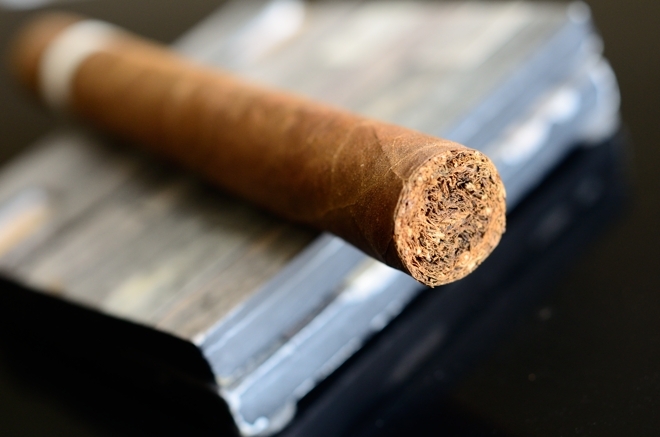 The wrapper’s texture is very smooth with only some very slight tooth, and slight oil with a few larger veins running through the cigar’s body up to the round triple cap. The wrapper itself feels a bit thin and delicate while the body of the cigar is really heavy and jam-packed with tobacco. 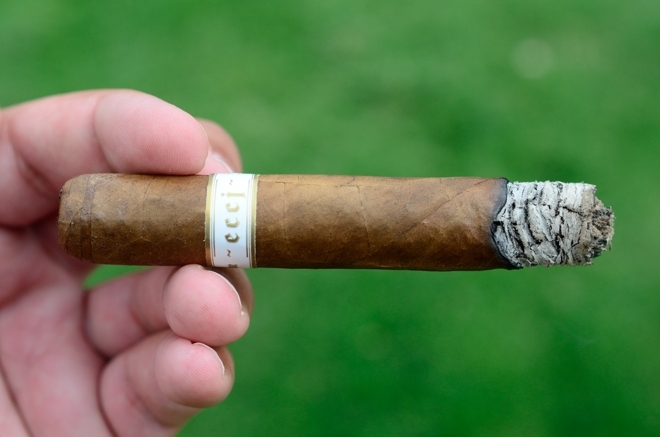 There was some softer areas around the foot of the cigar but nothing really concerning. 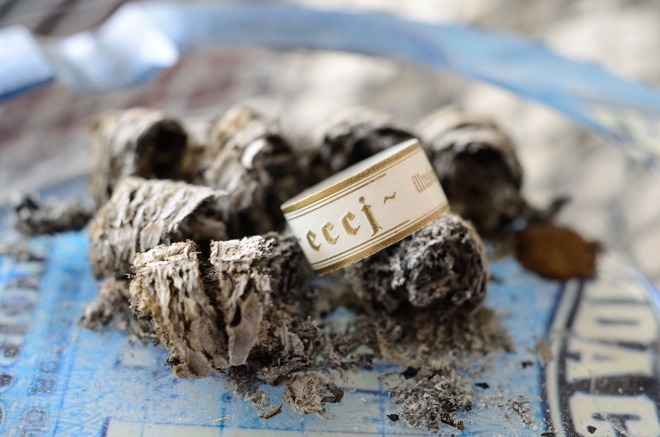 The cigar is polished off with the same elegant band found on the Epernay and past ~eccj~ blend. It’s small, simple, and pearl white with the word “~eccj~” embossed with gold ink in the front, and “Illusione” very small in the back. Again, these are some of my favorite bands out there. They’re simple, and put all the focus on the cigar instead of the design on the band. 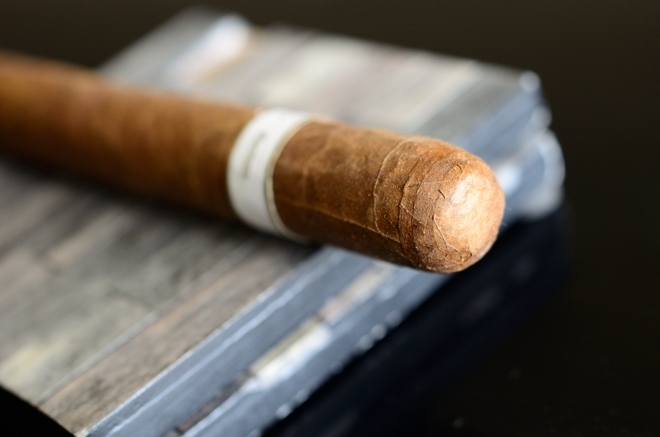 The wrapper gives off a strong honey and tobacco aroma while the foot of the cigar is much more modest only showcasing some slight spice and earthiness. The cap cut clean and easily using my double bladed Palio cutter. The cold draw is very floral with notes of grain and tobacco with some very subtle spice mixed in there. The Illusione ~eccj~ starts out with a quick splash of black pepper laced with spice, honey, cedar, sweetness, leather and floral notes. Despite the cigar being jam-packed with tobacco the draw is flawless. Each little puff kicks out massive clouds of thick white smoke while the ~eccj~ gives off almost no stationary smoke as it rests in my ashtray. The burn line is dead even and razor thin leaving behind a nice trail of compacted white and dark gray zebra-patterned ash which held on for about an inch and a quarter before falling into my ashtray. A whole mess of sweetness and spice have emerged into the second third of the Illusione ~eccj~. Along with the sweetness and spice the honey and floral are still rocking hard backed by cedar, and leather as well as some great earthiness. There is no shortness of flavor in this bad boy. The retrohale showcases a much heavier spice and pepper with deep cedar and honey. The burn line is still flawless and I’m not really feeling anything in the nicotine department as I close out the second third. A bit of citrus and pine snuck into the flavor profile in the final third of this Illusione ~eccj~. Along with those additions, the cigar still offered bold cedar and spice with honey and sweetness. I’m impressed that a lot of the flavors had lasted this deep into the experience, and were just as bold as they were at the beginning of the smoke. It took me a little over an hour and half to take the ~eccj~ down to the nub and I experienced absolutely no harshness, nor really anything nicotine kick. 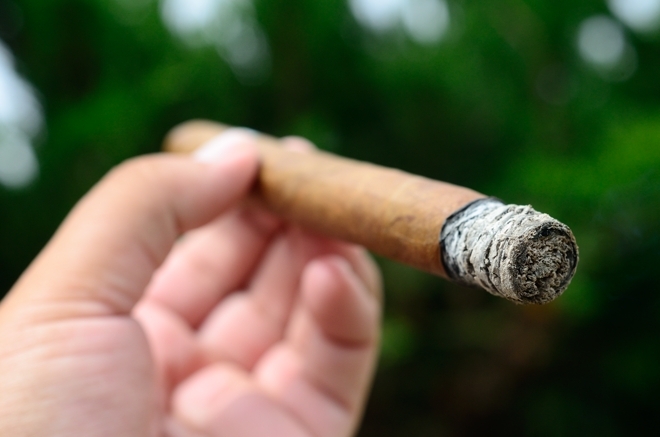 In fact, the cigar finished off very creamy and smooth as I let it burn down until my finger tips were on fire. I never once had to touch up, or relight. I’ve said it before, and I’ll say it again. If I was forced to smoke only one brand for the rest of my life it would have to be Illusione. 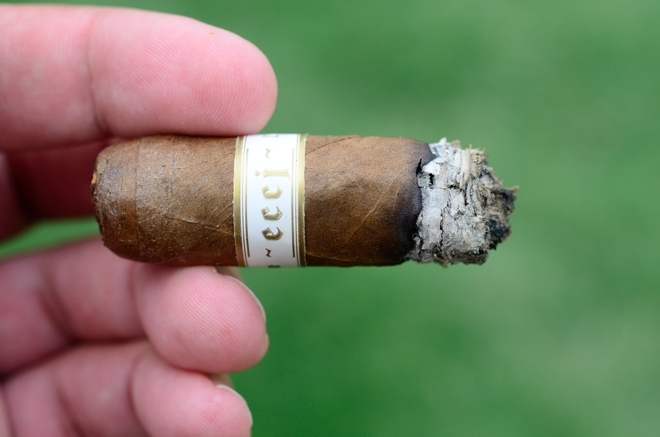 The ~eccj~ is a great example of an absolutely great cigar experience. The bold, complex, yet complimentary flavors provide an amazing profile with great construction and flawless burned all delivered at a decent price point. Yes, it’s one of the more expensive cigars in Illusione’s portfolio but it more than satisfies and I’d pay it time and time again. While the ~eccj~ is limited, it’s still widely available and this is a box-worthy purchase for sure as it would hold a place in my regular rotation for a very long time. Being that I am huge on Belgian beers, one of my favorite summer styles is a nice, heavy, tripel. Brewed at the Brouwerij Bosteels in Belgium, the Tripel Karmeliet clocks in at a bold 8.4% ABV. The Tripel Karmeliet starts out with some nice fruit, celery, honey, sweetness and floral flavors with a light mouthfeel before finishing crisp with citrus, floral, and pine and a bit of tart on the aftertaste. The beer’s flavors obviously married up well with the floral, citrus, and honey in the Illusione ~eccj~ while the spice and cedar from the cigar added a new level to the beer. I would also recommend pairing the ~eccj~ with a nice Belgian Dubbel or Quad, a spicy tawny port, or a great cup of dark coffee. Dang dude, this cigar sounds amazing! I absolutely loved this cigar as well but I still think the original corona gorda is my favorite Illusione of all time…I will cherish my last 3 sticks and smoke them on special occasions…I will be grabbing more 20th’s before they are all gone (wont be long). Great review! If you had to give it a number 1-100 what would you give this stick? I wish I had more of the originals left. Only got to smoke a few. I’m so off on ratings.. they aren’t my favorite things in life. But as general as I can I would rank it a low to mid 90.